Hey ladiess ! I believe most of you have heard of Makeupalley or Birchbox especially when it comes to beauty product reviews. 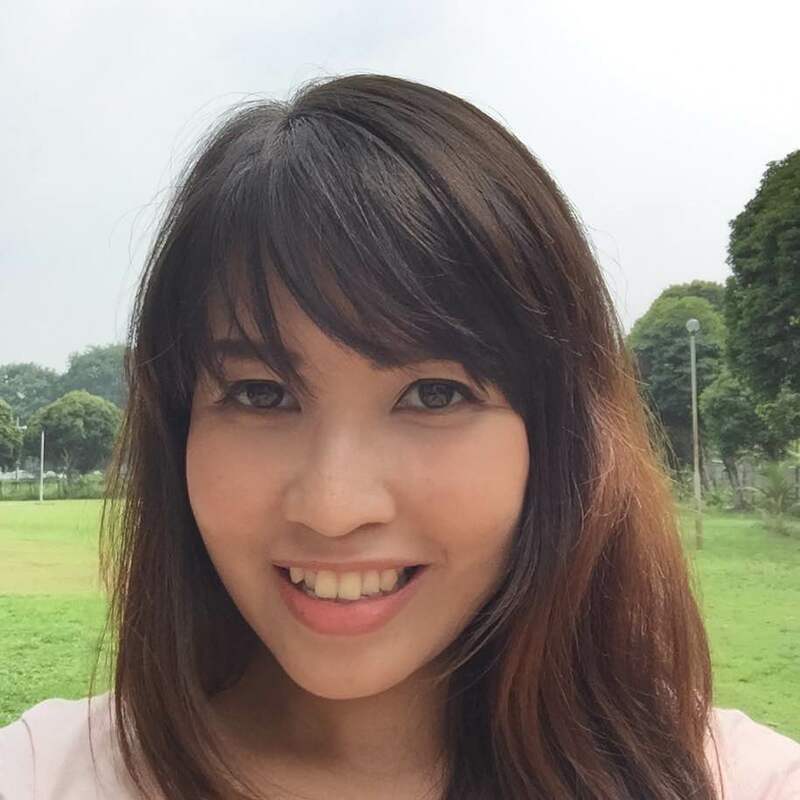 Today I am going to recommend a website to everyone of you- MuffinBeauty, a beauty review social platform for Asians! MuffinBeauty is the first beauty review community targeting Asian women. People are increasingly looking up online reviews at TripAdvisor or any other similar websites before deciding on which hotel to stay. And MuffinBeauty is like a beauty version of TripAdvisor in Asia. A platform where everyone shares information and makes neutral reviews about beauty products. There is a Muffin Beauty Club set up especially for beauty enthusiasts and bloggers who share reviews in their own social media sites actively. With only minimum 10 reviews written in MuffinBeauty, you already have a ticket to join this club and a member can access the redemption page in order to receive products for making reviews. This is how the team rewards review contributors, I was told we stand higher chances to receive products for review if we constantly share about genuine and useful reviews to the community. I am invited to join MBC by Muffin team and there it goes my first beauty box! Check out their page for more information. 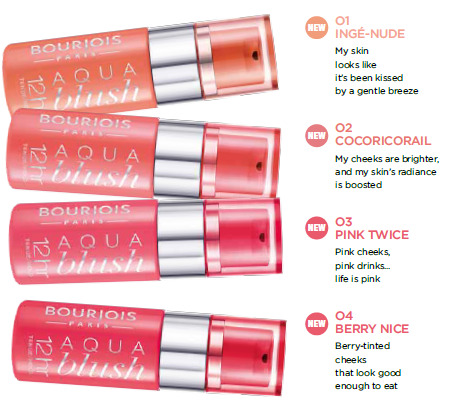 Bourjois is a French brand. It's a huge name in the Europe and recently landed in Malaysia's drugstore (if I'm not mistaken last year). Not many people know about this, Bourjois is the sister company of Chanel. The products are made by the same manufacturer with similar ingredients. Both the brand focus on different market. 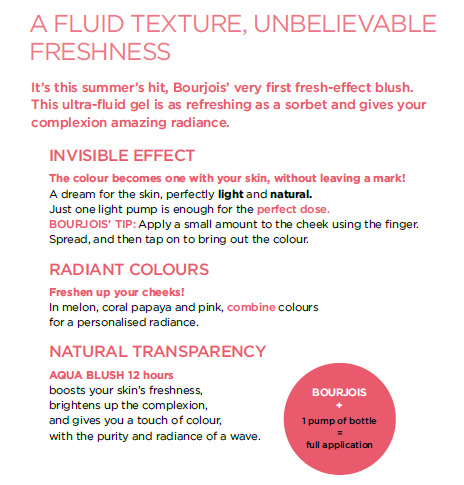 So if you're looking for a good makeup product without hurting your pocket, Bourjois is the brand you should go for. After foundation, apply one pump on the apple of your cheek in dabbing motion for richer color. For more transparent effect, spread it evenly. Seal your makeup with loose powder after. Use fingers or flat top brush to blend. Blush brush may not work well for the product. It tends to eat up the products. Thumbs up for the long lasting effect. It is also waterproof, which makes a perfect match for swimming or beach day out. However, the gel texture can take awhile to get used to, especially for those who have been using powder blush for a long time. The shade leans towards sheer side. However, the colour is buidable. I love the look on me. It looks so soft, especially with the Cocoricorial shade. It has 4 shades to choose from. And I love the Cocoricorial shade - warm peach tone, which suits my tanned skin. I wish it comes with dark brown shade for contouring. It blends really smoothly with my foundation and creates a natural look. Those who wants a no-makeup look. Perfect for travel, sports or water activities as it is waterproof and long lasting. CI 45410 (RED 28 LAKE), CI 73360 (RED 30 LAKE), CI 75470 (CARMINE), CI 77000 (ALUMINUM POWDER), CI 77007 (ULTRAMARINES), CI 77163 BISMUTH OXYCHLORIDE), CI 77491, CI 77492, CI 77499 (IRON OXIDES), CI 77510 (FERRIC FERROCYANIDE), CI 77742 (MANGANESE VIOLET), CI 77891 (TITANIUM DIOXIDE)].